As I am off for a vacation to India very soon, I started to clear my kitchen and found black urad dhal & Horse gram were left over and decided to have them for lunch today. 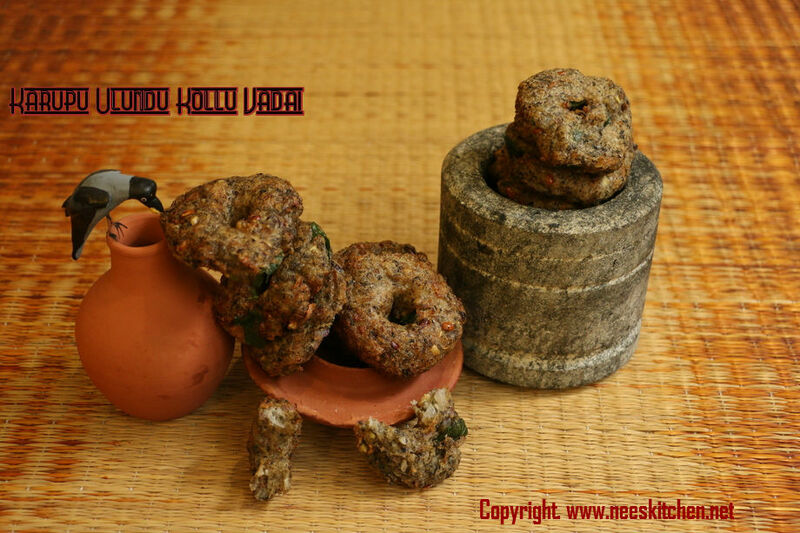 This is one regular dish which I prepare at home during festivals rather than the regular medhu vada. Karupu Ulundu (Black Urad Dhal) & Kollu (Horse gram) vada is a variation from the regular Medu vadai. Urad dal is good for women as it has iron, folic acid, calcium, magnesium, potassium which makes it a healthy pulse. Horse gram is the most protein-rich lentil found on the planet. It is very high-powered. That’s why race horses are fed with this gram, which is called horse gram in the market. I have been trying to the baked version of this but it never comes out properly like the fried one. Hopefully will get the baked version soon by adding correct proportions. 1. Soak Black Urad dhal and Kollu separately for 4 hrs. 2. Strain the water from Urad dhal and Grind until fluffy. You may sprinkle water if needed but it should finally come like a butter. 3. Strain the water from kollu ,add salt & Grind it. 4. Grind until kollu is little grudgy or you may wish to grind as a paste also. I prefer to keep a bit grudgy so that the vada turns to be crispy. 5. Add onion, green chili , ginger, curry leaves to the batter. 6. Keep a small container with water. Soak your hands. 7. Take the batter and make them as a ball. The batter should not stick to your hand. This is the right consistency. 8. Make a hole to the batter ball and deep fry in oil. 9. Fry until the ‘ssssshhh’ sound stops flipping in between. 10. Put the vada in a paper to strain the oil. 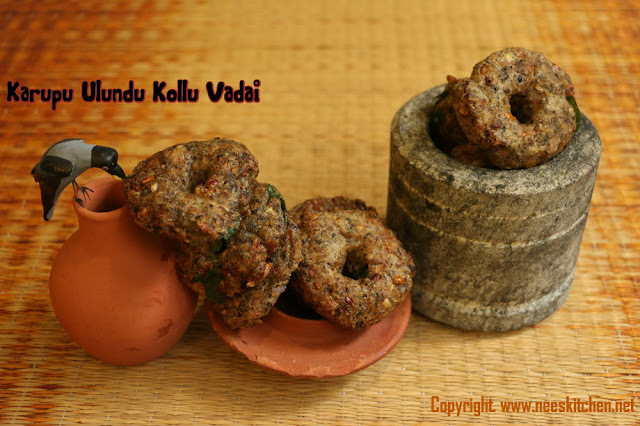 Karupu ulundu vadai is ready. Serve it with a good chutney. You may wish to add pepper , I did not add because Kollu is already body heat. You may adjust the chili quantity. As mentioned earlier, you may grind the kollu in a grudge consistency to get the crispiness. It is best if you add in grinder rather than mixer.